Did you know the number of Americans who will spend the Fourth of July holiday at other people's homes is approximately 41 million? That is some major entertaining going on! Are you planning to invite guests over or will you be one of the 41 million attending the festivities elsewhere? Either way, I am sure there will be a lot of grilling going on! If you're anything like me, you probably need some new and fresh ideas for this years Holiday. Here are my 5 tips for Fabulous Fourth! Start your planning with a buffet menu, one that can easily be set up and taken down. You will want to include barbecue favorites that you can easily prepare ahead of time. Items like coleslaw, fruit salad and homemade ice cream. I like to do all of my prep work ahead of time, either the day or night before the 4th. This includes shucking corn, marinating chicken and ribs and slicing some homegrown strawberries. Curious what we are serving this year? All of these items can be prepared the day before, except for the grilling and warming of baked beans. Like I said, easy peasy! Pick your drinks! Don't feel like you have to offer everything, just choose a few and go with it. Use drink dispensers on the buffet line, something for the adults and something for the kids. Try pre-mixing margaritas or sangria and lemonade, or iced tea. No matter what, be sure to have plenty of water available, especially if you and your guests will be out in the heat most of the day. Here's Natalie's favorite margarita recipe everyone will LOVE! Fill blender with crushed ice. Pour in limeade concentrate, tequila and triple sec. Blend until smooth. Pour into glasses and serve. Set the Table! Trust me on this one, you don’t' need anything fancy. Little items can go along way if you use them right. For instance, instead of buying or using a blue, red and white linen, stick to one color. You can add little pops of color elsewhere to get the effect you're looking for. Try even a rustic natural look on the table. 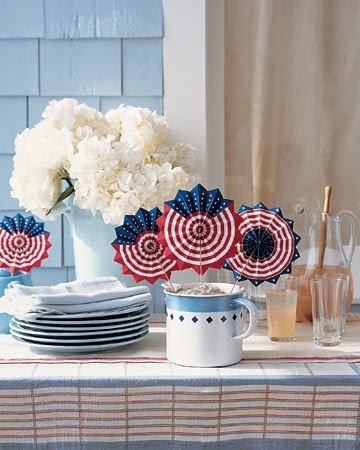 Add pops of color like using vintage red lanterns, a few charger plates and bundles of flatware for easy pick up. Don't forget the lighting. The lanterns will add a little, but try to use some additional lights if you are staying outside for fireworks. I suggest uplighting trees and using galvanized buckets with bamboo to string globe lights on. This will create an intimate setting your guests will not want to leave! Don’t forget to accommodate your guests and provide entertainment. This can be as easy as creating a soundtrack and playing it through speakers from your iPod, to providing games for your guests to play. The Fourth of July is all about being outside with company, so why not get a game of crochet or volleyball going. Games like washers or beanbag toss is great too. I always love to add a few items around the house to accommodate my guests. Either a tray with flavored water, chocolate mints in the bathroom, anything to make them feel more like home. It’s all about the little details! Plan for the Fireworks. If you are one of the lucky ones who are able to watch them from your house, then set up a special viewing area. Bring out blankets and large pillows to create a comfortable viewing area. Can’t see them from your house? No biggie? Set up just as you would outside – inside! Last year it was so warm we all moved indoors, turned out all the lights [except for the TV] and created stars on the ceiling, just like if we were outside. It was perfection! The perfect watching fireworks treat? Our family tradition of course! Treat your guests to homemade ice cream root beer floats …yummo! To become one of our Brides and join the TBS Family, email Natalie at thebridalsolution@gmail.com for pricing options and specials!